Gina Silvestro is constantly thinking outside of the standard nail “bubble” and strives to stay on the cusp of trends, while sharing and instilling innovative thinking and techniques with her peers. For this month’s cover we asked her to create something fun and bubbly. Gina Silvestro has been a frequent NAILS contributor for the last several years, but she’s actually been a nail tech for more than 19 years. Starting off as a receptionist in a nail salon while she was still in high school, she had already decided that nails were her passion. 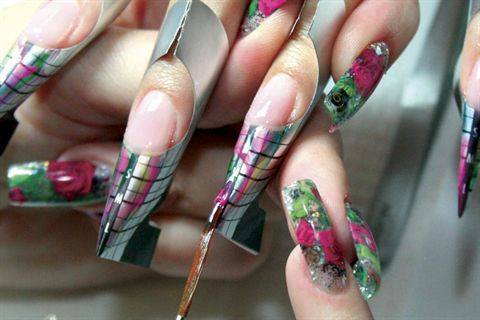 Her artistic abilities were a natural fit with creating nail structure and nail art. 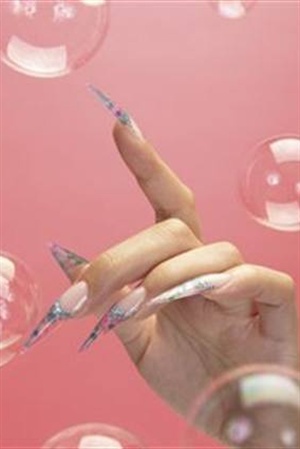 She began honing her nail art skills through handpainting and airbrushing, but over the last five years, she’s focused primarily on working with gels. Gina, who moved her business into Michael K. Galvin & Gel Essentialz Salon in Cranston, R.I., is also an Akzentz Internationally Certified Educator (I.C.E.) and the east coast distributor for the gel line. 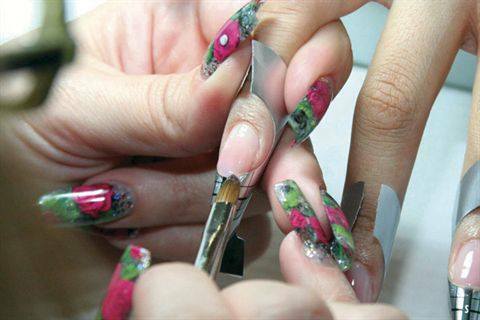 She runs the nail department at the salon and operates her distribution business out of the lower level. She has traveled all over the world to learn and master 3-D acrylic and gel nails, as well as to teach and troubleshoot with other nail techs. Realizing how difficult it is for many nail professionals to find local classes, she is also involved in the grassroots education program The High Road to Education (HRTE), where techs get together to learn. She’s also created a variety of short video tutorials, which are available on her website (www.gelessentialz.com). She’s constantly thinking outside of the standard nail “bubble” and strives to stay on the cusp of trends, while sharing and instilling innovative thinking and techniques with her peers. For this month’s cover we asked her to create something fun and bubbly. 1. Prep the nail, shape distal edge, apply Affixit Protein based primer, and apply Akzentz Pro-tab forms. 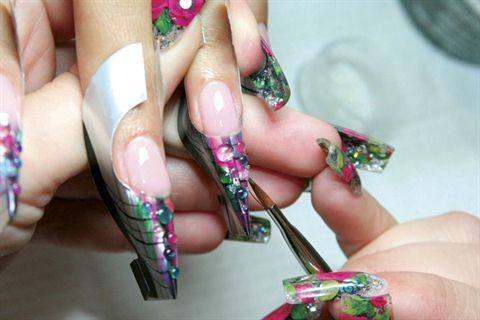 For stiletto-shaped nails pinch the tip of the form closed. 2. Apply a thin layer of bonding gel. Cure for two minutes. Apply Akzentz Natural Coverage Cool Pink to the nailbed, slightly extending the nail bed on the form. Cure for two minutes. 3. Apply a layer of Trilite gel on the tip to the desired length. Cure two minutes. You can also pinch the nail at this step. When you apply Trilite, cure for one minute then pinch the nail with a pinching tool, and continue curing for the remaining minute. 4. Apply another thin layer of Trilite gel. (Do not cure yet so the colors will blend better.) 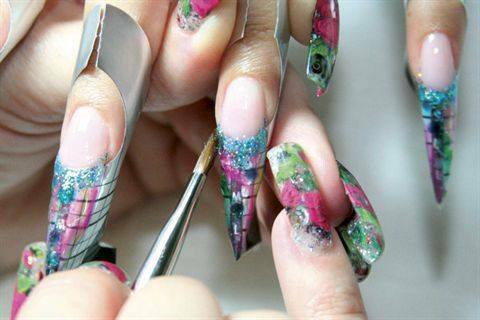 Stripe desired colored gels down the tip. The colors used for the cover (Akzentz Options Gel Art Blue, Purple, Yellow, Green, Sparkles Raspberry, and Hot Pink) were diluted with a 1-to-1 ratio of Trilite gel for a more transparent look. Work quickly to avoid running. Once all of the colors are applied, feather your brush through the colors to lightly blend/swirl the colors. Cure for two minutes. 5. Apply another thin layer of Trilite and place your choice of embedded objects where desired. 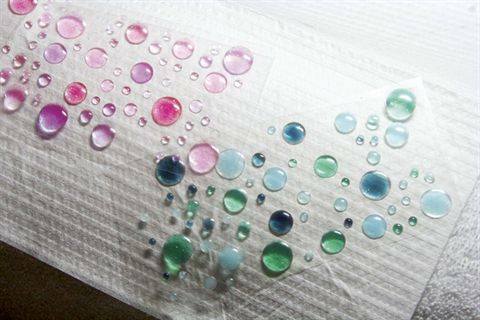 For the cover, Gina found little epoxy dots in the scrapbooking section of a local craft store that were perfect for the bubble cover. She then added some clear glass beads for a “bubbly” look in the gel. Cure for two minutes. 6. Dab Options Aurora Blue Sparkles at the smile line. Cure for two minutes. 7. Cap the design with one to two layers of Modeling Gel followed by Trilite gel, curing for two minutes after each layer. 8. Remove dispersion layer with Gel Cleanser, carefully remove forms and file to shape. Remove any dust and contaminates and apply Top Gloss Clear Gel. Cure for two minutes. 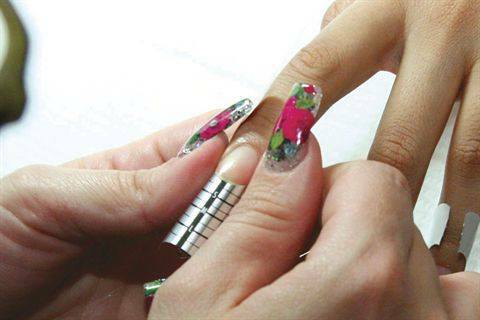 Remove dispersion layer and apply cuticle oil. Cover tech Gina Silvestro prepared her many colored gel pots before applying the bubble-designed stiletto nails to our model Traycee King. Gina bought these epoxy dots in the scrapbooking section of a craft store, but you could use pretty much anything you can find to encase in the gel. 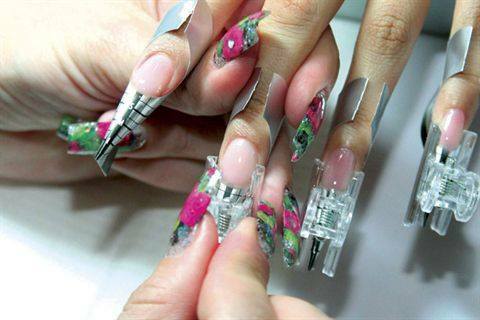 To see a video of Gina recreating these nails, go to www.gelessentialz.com.